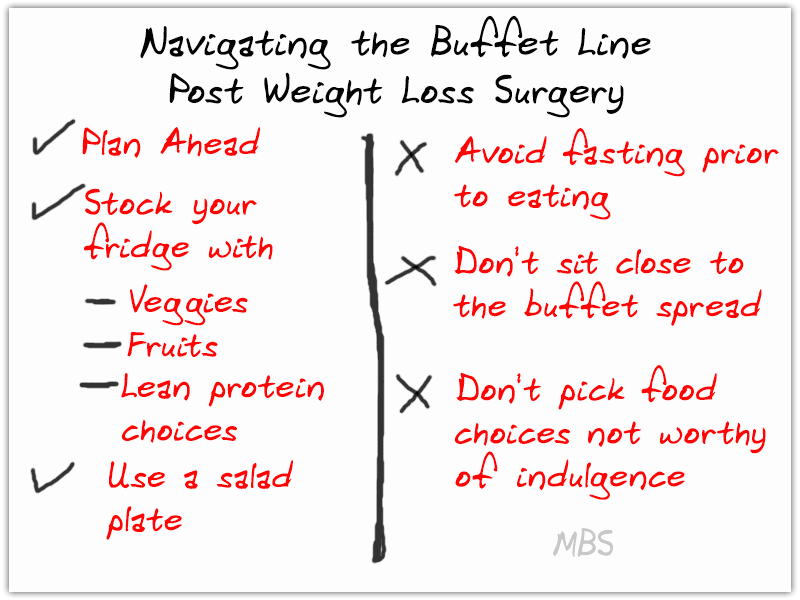 How to Survive Buffet Lines After Bariatric Surgery? The holidays generally come with a healthy dose of stress and stress revolving around food, more so if you’ve had bariatric surgery. After having bariatric surgery, you also have more things to think about with your food choices this time of year. Plan Ahead of Time. Try to make some healthier choices earlier in the day, leading up to a holiday party. Make sure to have some extra fruits, vegetables, and lean protein choices. One thing that is almost impossible to avoid at family reunions or parties is the Buffet Line. Eat healthier earlier in the day. Look at what is being offered on the buffet before you even grab a plate and make a mental plan of what your dish will look like and what foods are worth the indulgence and which aren’t. Use a salad or appetizer plate instead of a dinner plate. Pick one dessert or indulgent food to have in a small portion and savor each bite. Having a little helps you feel less deprived. Avoid sitting close to the buffet table. This helps prevent grazing and overeating. Eat a small healthy snack with some protein before you leave the house to curb those cravings. Scan the food table at a party before you grab a plate. This lets you decide what items you want to choose, so you don’t overfill your plate. Try to pick a good protein source first. Shrimp, cubed cheese, sliced deli meat, and mixed nuts can be a good choice for those of you that are later post-op. If you are <6 months out from surgery, cubed cheese and deviled eggs are generally well tolerated. Next, go for some vegetables or fresh fruit to round out that protein and feel free to add a little dip. Soup is almost always a good choice and easily tolerated at any stage. Be cautious of the “snack bowls” at parties. Candy, chocolate, Chex Mix, or crackers are in these bowls. They are typically empty calories that provide little protein, vitamins, minerals, or fiber and may fill you up before the “healthy” stuff makes it into that new pouch. If you want, do choose one “occasional” item to have so that you do not feel deprived. This may be a small cup of eggnog, a piece of fudge or peanut brittle, etc. Don’t be afraid to say “No Thanks” when the host asks if you want to take a plate of leftovers or cookies home at the end of a party. Hope these tips work for you! Let us know in comments! What are some tips for dining out after weight loss surgery?